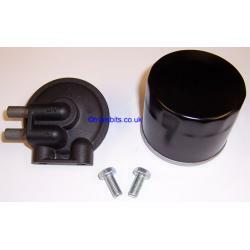 This is an oil filter kit, which will fit just about any bike with external oil lines. The head has two tapped holes making it easy to fit to any bike (bolts supplied), you just need to make a suitable bracket. The diameter is approx 3 inches and the overall height 4 inches. Supplied complete with filter, and spare filters are readily available from me, or any car shop. This comes with a pattern filter which is 65mm high, or you can choose the Champion filter, which is 75mm high. The oil hose fixings are 3/8 inch or 9.5mm. This type of oil filter arrangement was standard on the Norton Commando, and it should always be fitted to the oil return line.